The treatments for many autoimmune diseases are limited in efficacy, and long-term use is associated with severe adverse events. The tyrosine kinase inhibitors have proven to be well tolerated for long treatment periods, with minimal adverse events, in the oncology population. These agents have recently been used to treat autoimmune diseases. We review the potential mechanisms whereby tyrosine kinase inhibitors may modulate the immune response and inhibit fibrogenesis and discuss the current evidence for their use in the treatment of autoimmune diseases of the kidney. According to 2011 data from the U.S. Renal Data System, GN caused ESRD in 10% of prevalent dialysis patients and 6% of incident patients. Almost 10,000 incident dialysis patients from 2005 to 2009 carried the histologic diagnosis of membranous nephropathy, membranoproliferative GN type I, or lupus nephritis (LN).1 In these inflammatory diseases, B cell–mediated antibody production, T cell proinflammatory cytokine production, macrophages, and dendritic cells all play a role in the pathogenesis of renal injury.2,3 Inflammation plays an important physiologic role in response to injury, but prolonged infiltration of lymphocytes, macrophages, and dendritic cells also leads to fibrosis through increased generation of reactive oxygen species and production of profibrotic cytokines and growth factors. Many of the drugs currently used to treat autoimmune diseases of the kidney were originally developed as antineoplastic agents; they have suboptimal efficacy, and toxic adverse effects limit their use. A major advance in oncology has been the advent of tyrosine kinase inhibitors (TKIs). This class of medication is relatively well tolerated and has immunomodulating and antifibrotic properties that may render it a valuable tool in the treatment of autoimmune diseases of the kidney. Imatinib was the first TKI to be approved by the U.S. Food and Drug Administration for treatment of CML.6 Imatinib blocks nonreceptor Abelson tyrosine kinase (c-abl) that is constitutively active in CML because of the BCR-ABL fusion oncogene. Imatinib’s kinase inhibition is not specific for c-abl; it also blocks platelet-derived growth factor receptor (PDGFR), stem cell growth factor receptor (c-kit),7 discoidin domain receptor (DDR) 1 and 2,8 macrophage colony-stimulating factor receptor (c-fms),9 and lymphocyte-associated kinase (lck).10 Nilotinib is a TKI that inhibits the same PTK repertoire as imatinib but has an increased potency for c-abl inhibition. Although most of this review focuses on imatinib, nilotinib should exert similar effects. 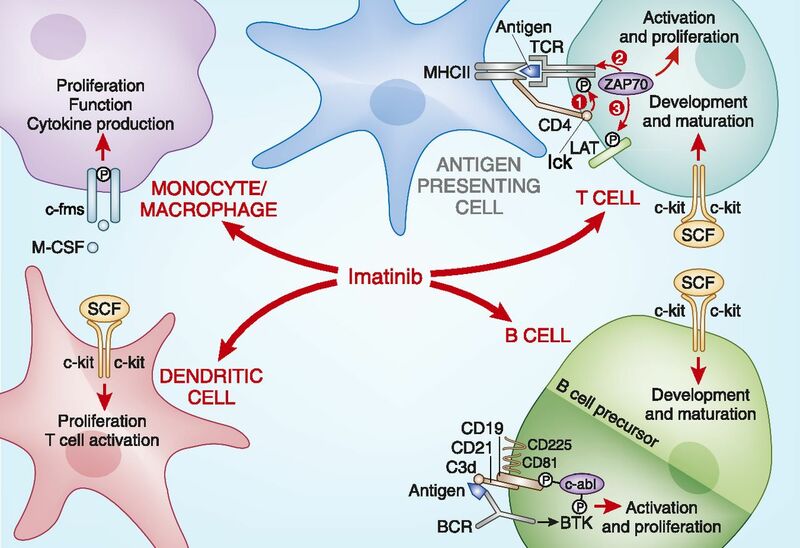 Imatinib was originally designed for the treatment of CML, but its inhibitory effects on c-abl, c-kit, DDR, c-fms, and lck render it a potent immunomodulatory agent. Imatinib may also have antifibrotic properties both by modulating inflammation and by inhibiting PDGFR, DDR, and c-abl, a downstream mediator of TGF-β–dependent matrix production.11 Imatinib’s relatively safe adverse effect profile, coupled with its immune-modulating and antifibrotic effects, serves as a rationale for investigating this TKI as a potential therapeutic option for immune-mediated kidney diseases.12 Despite promising results with the use of imatinib in murine models of kidney disease, only two case reports have described its use in human kidney disease.13,14 This review summarizes the molecular mechanisms whereby imatinib alters the immune and fibrotic responses to injury, discusses the use of imatinib in animal models of renal injury, and reports the clinical data using imatinib to treat immune-mediated diseases of the kidney. Imatinib has various immune modulating properties on B cells, T cells, dendritic cells, and macrophages, all of which play a role in the pathogenesis of chronic immune-mediated kidney disease. Through inhibition of c-kit, lck, c-abl, and c-fms, imatinib affects development of immune cell progenitors, immune cell activation, proliferation, and function (Figure 1). We describe the cell-specific effects of imatinib on key components of the immune system. Imatinib’s immunomodulatory effects. Red arrows indicate inhibition. B cell section: Inhibition of c-abl by imatinib prevents phosphorylation of Y490 of CD19, which in turn prevents downstream signaling of the signalosome (CD19, CD21, CD81, and CD225). Inhibition of c-abl phosphorylation of BTK also inhibits downstream signaling of BCR. These two actions inhibit B cell activation and proliferation in response to BCR stimulation by antigen. c-kit inhibition impairs B cell development and maturation. SCF, stem cell growth factor. T cell section: Imatinib directly inhibits lck, which phosphorylates the T cell receptor (TCR) (1). This leads to reduced recruitment of Zap70 (2) and subsequent decreased phosphorylation of linker for activation of T-cell (LAT) (3). The inhibition of this sequence of events decreases T cell activation, proliferation, and generation of cytokines. MHC, major histocompatibility complex. Monocyte/macrophage section: Imatinib inhibits c-fms, preventing proliferation, function, and production of such cytokines as IL-6 and TNF-α. Dendritic cell section: Dendritic cells treated with imatinib have reduced proliferation in response to stimulation with Flt3. In addition, imatinib-treated dendritic cells are unable to elicit a T cell response. Dysregulated antibody production by B cell lymphocytes is important in the pathogenesis of autoimmune diseases of the kidney. c-kit is important for B cell lymphopoiesis, as shown by c-kit–deficient mice, which have a significantly reduced number of pro–B cells as adults.15 This effect is probably mediated through src kinase because mice that contain c-kit with a mutated src kinase docking site show a reduction in pro B cells similar to that of the c-kit null mouse.16 Furthermore, treatment of normal adult mice with imatinib recapitulate this phenotype, suggesting that inhibition of c-kit with imatinib inhibits lymphopoiesis.16 Imatinib’s effects on B cell development could also be mediated by inhibition of c-abl because mice with a mutated c-abl demonstrated markedly diminished numbers of B cell precursors in both the bone marrow and spleen.17 Thus, imatinib’s inhibition of c-kit and c-abl may compromise normal B cell development in adults. Additional clinical data support imatinib’s role as an inhibitor of B cell function, thus validating the preceding studies in murine models. Immunoprofiling of patients receiving imatinib for the treatment of CML and GIST reveals that imatinib reduces levels of IgG, IgA, and IgM without an associated decrease in peripheral lymphocyte counts.24,25 Imatinib reduced immunoglobulin levels in 69 of 72 patients with CML and 7 of 15 patients with GISTs, and immunoglobulin levels did not decrease in 20 patients with CML not treated with imatinib.26 Furthermore, 21 of 30 patients with CML receiving treatment with imatinib demonstrate an abnormal plasma cell phenotype that correlates with decreased γ-globulin levels.27 In summary, animal models suggest that imatinib affects the B cell immune response through decreased B cell development and function, and clinical studies suggest that imatinib dampens B cell production of antibodies. T cells secrete proinflammatory cytokines, such as IL-2, IFN-γ, and TNF-α, all of which have been implicated in autoimmune disease. IL-2 secretion has been used as a surrogate measure for downstream T cell receptor signaling, and imatinib inhibits this IL-2 secretion.10 Imatinib has also been shown to inhibit production of TNF-α and of IFN-γ in T cells from both healthy donors and patients being treated for CML.32,33 In summary, imatinib inhibits the T cell response by reducing lymphopoiesis through blockade of c-kit and c-abl and modulation of T cell function through lck, resulting in decreased activation, proliferation, and secretion of proinflammatory cytokines. Antigen-presenting cells, such as macrophages, monocytes, and dendritic cells, are an important component of the inflammatory response present in multiple models of kidney disease.3,34 Macrophages propagate kidney injury through secretion of inflammatory cytokines, production of profibrotic growth factors, and generation of reactive oxygen species.35–37 Macrophage depletion attenuated fibrosis in a unilateral ureteral obstruction (UUO) model of injury, suggesting that macrophage infiltration may be deleterious.38 Imatinib-treated monocyte/macrophages in vitro had reduced proliferation in response to macrophage colony stimulating factor.9 This finding was attributed to imatinib’s inhibitory effect on the phosphorylation of c-fms, the receptor for macrophage colony-stimulating factor.9 Inhibiting c-fms with a monoclonal antibody in mice reduces macrophage accumulation and proliferation in both the UUO and db/db diabetic models of injury.39,40 Furthermore, the diabetic db/db mice treated with anti–c-fms have reduced tubular apoptosis and fibrosis, suggesting that macrophages are integral to the pathophysiology of this injury model. Imatinib also impairs the function of monocytes that differentiate into macrophages upon movement from the bloodstream to tissue. Human monocytes treated with imatinib in vitro had reduced phagocytosis, impaired formation of pseudopodia, and reduced production of proinflammatory cytokines (IL-6, TNF-α) in response to lipopolysaccharide.41 Thus, imatinib treatment potentially modulates kidney injury through inhibition of monocyte-macrophage proliferation and function. 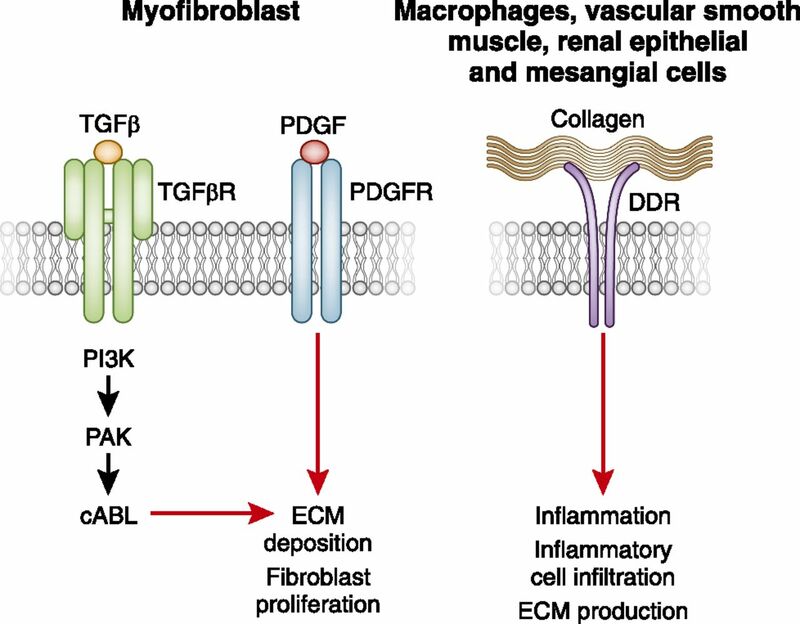 Progressive fibrosis characterized by extracellular matrix (ECM) accumulation is the common pathway from injury of any cause to ESRD.45 Imatinib not only has the potential to reduce fibrosis indirectly through decreased inflammation but also may directly inhibit fibrogenesis by modulating TGF-β, PDGFR, and DDR signaling (Figure 2). Fibrogenic pathways targeted by imatinib. TGF-β inhibition of c-abl inhibits a non–Smad-dependent TGF-β pathway and reduces fibrosis. This is a cell specific for mesenchymal cells. PI3K, phosphoinositide 3 kinase; PAK, p21 activated kinase. Imatinib inhibits PDGFR, thereby reducing ECM production and fibroblast proliferation DDR is the first tyrosine kinase to be shown to bind ECM. Inhibition of DDR through imatinib may result in decreased inflammation and ECM production, as demonstrated in a DDR null mouse. PDGF, a known mitogen for mesenchymal cells, can stimulate ECM production in mesenchymal and parietal epithelial cells in vitro.48 The four isoforms of PDGF (A, B, C, and D) signal through the tyrosine kinase receptor PDGFR, which exists as a dimer composed of α and β chains.48 PDGF and its receptors are upregulated in numerous murine injury models and in human kidney disease.48 Inhibition of PDGF signaling through neutralizing antibodies, oligonucleotides, and chemical antagonists can reduce mesenchymal cell proliferation and ECM accumulation.48 Imatinib also blocks PDGF signaling and inhibits PDGF-induced mesangial proliferation in vitro.49 In addition, a murine model of diabetes (streptozotocin-treated apoE knockout mice) showed attenuated collagen type I and IV production when given imatinib, a finding associated with reduced expression of PDGF, PDGFR and TGF-β1.50 Thus, imatinib’s inhibition of PDGFR signaling is another potential mechanism whereby imatinib reduces fibrosis. Through all of the preceding mechanisms, imatinib is a potential therapeutic agent for autoimmune mediated kidney disease. Imatinib has been investigated in various murine models of kidney disease and has been shown to improve both immunologic and fibrotic measures (Table 1). Imatinib’s inhibitory effect on B cells was illustrated in two models of murine LN and a mouse model of cryoglobulinemia.53–55 In the two LN models, imatinib reduced anti–double-stranded DNA levels and decreased immune complex deposition.53,54 This resulted in improved survival, creatinine, and proteinuria.53,54 Cryoglobulinemia is another autoimmune disease caused by pathologic antibody secretion. A transgenic mouse model with constitutively active thymic stromal lymphopoietin resulted in cryoglobulin production and renal histologic lesions consistent with membranoproliferative GN caused by cryoglobulinemia.55 Imatinib treatment in this mouse model reduces the cryocrit, serum levels of all immunoglobulins, mature and immature B cells, systemic manifestations of the disease, and C3 glomerular deposition. To highlight the immunomodulatory role of imatinib, the same thymic stromal lymphopoietin tg mouse model was treated with angiotensin-converting enzyme inhibition or angiotensin-receptor blocker therapy alone and showed no improvement in markers of immunologic activation.56 Imatinib also inhibited T cell infiltration in mouse models of anti–glomerular basement membrane (GBM) disease and chronic allograft nephropathy.57,58 Macrophage infiltration was decreased in models of chronic allograft nephropathy, streptozotocin-induced diabetic nephropathy, LN, and anti-GBM disease treated with imatinib whereas nilotinib decreased macrophage infiltration in the 5/6 nephrectomy nephron reduction model.50,53,54,57–59 Inflammatory cytokines were decreased by imatinib treatment in the models of anti-GBM and LN and by nilotinib treatment in the 5/6 nephrectomy model.54,57,59 These findings provide further evidence for the immunomodulatory properties of imatinib and nilotinib. Imatinib also markedly reduced ECM deposition and fibrosis in most of these murine models of kidney disease. 11,49,50,53,55,58–61 PDGF signaling was disrupted by imatinib, as shown by decreased levels of PDGF-A,58 PDGF-B,50,58,59, and PDGFR-β.50,54,57,58 Imatinib also decreased levels of TGF-β50,53,54,58,59 and TGF-β type I receptor58 as well. Therefore, imatinib reduces indices of fibrosis in murine injury models with associated suppression of TGF-β and PDGF signaling, suggesting that imatinib may have beneficial antifibrotic effects in additional to its immunomodulatory properties. As for kidney disease, a patient with biopsy-proven membranoproliferative GN had improvement in proteinuria and creatinine after initiation of imatinib for concurrent CML.14 Imatinib treatment also resulted in a dramatic improvement in a patient with idiopathic type II cryoglobulinemia with kidney involvement. The patient’s creatinine level, symptoms, and cryocrit improved upon starting imatinib, worsened upon withdrawal of therapy, and dramatically improved with reinstitution of therapy.13 Table 2 lists ongoing and completed trials using imatinib or nilotinib for fibrotic diseases and rheumatoid arthritis. Imatinib and nilotinib have improved both fibrotic and inflammatory markers of many murine models of kidney disease and, anecdotally, two clinical cases of immune-mediated kidney disease. As discussed here, the putative mechanism whereby TKI may be effective therapeutically for autoimmune renal disease involves the inhibition of their many PTK targets: c-abl, c-kit, lck, c-fms, PDGFR, and DDR. Blockade of these targets may inhibit the immune response and suppress fibrosis, two vital effects for halting the progression of autoimmune kidney disease. Furthermore, imatinib’s mild adverse effect profile and long-term safety record, particularly in comparison with those of current treatment options for these diseases, make this drug a potentially attractive alternative pending further studies conducted specifically in patients with autoimmune diseases. Diseases likely to benefit most from this intervention would be those necessitating chronic suppression of antibody production, such as severe membranous nephropathy, systemic lupus erythematosus, chronic humoral rejection after renal transplantation, and cryoglobulinemic vasculitis. Given the current limitations of therapies for immune-mediated kidney diseases, clinical trials are desperately needed to determine whether imatinib provides a safer and more efficacious option. The authors would like to thank Gerald Schulman and Roy Zent for their mentorship and review of the manuscript. This work was supported by a Career Development Award from the Department of Veterans Affairs, Veterans Health Administration, Biomedical Laboratory Research and Development (L.G.). This material is the result of work supported with resources at the Veterans Affairs Tennessee Valley Healthcare System.